This 6 hour Emergency First Aid at Work course follows the full HSE syllabus. The course covers an understanding of the role of the first-aider including reference to available equipment, preventing cross-infection and the need for recording incidents and actions. 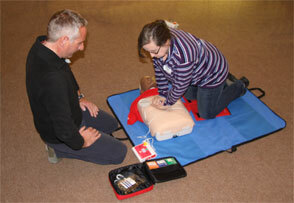 Our Emergency First Aid at Work course is run from Boulder Adventures in Llanberis. For groups of 6 people or more then please visit our private course page. Visit our bookings page for details on the booking process. "Other first aid courses I have been on have been boring! This however was a breath of fresh air: fun, practical, progressive and made sense!" "Loved the teaching style, very east to understand kept it simple without being patronising. Best first aid course I've done by far." "The practical scenarios were very work place orientated which made it relevant and more appropriate."